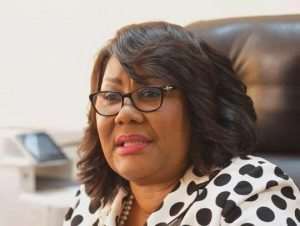 The Registrar-General, Jemima Oware says she cannot stop middlemen popularly referred to as 'Goro boys' from operating at the Registrar Generals Department. Although these activities are largely illegal, the Registrar-General said these middlemen are also human beings who are working to make ends meet. 'Goro boys' are middlemen who extort money from clients to offer them supposed speedy services at both public and private institutions that are supposedly not efficient in their work in terms of meeting client needs on time. Nonetheless, it is believed that their activities are often given a boost by officials of these same institutions who subsequently benefit from the largess they get from unsuspecting clients. Some anti-corruption crusaders have been campaigning against the activities of these middlemen and the payment of facilitation fees. But reacting to questions about these activities at her department at a multi-stakeholder business Integrity forum organized by the Ghana Integrity Initiative, Registrar General, Jemima Oware, said she cannot stop the 'goro boys' from operating at her front office because they are human beings and Ghanaians. “The goro boys are human beings, they are Ghanaians and I cannot throw them out of my front office,' she said. Asked if she was not worried about the threat 'goro boys' pose to the department’s integrity and the need for an action to be take against them, Madam Oware said individuals who do business with the Registrar General's Department should rather be smart. “That is why I said that when you get to the front office, deal with the officers who are in the cages who are properly tagged and go through the process yourself”. Meanwhile, anti-corruption crusaders are on a campaign to fight against the payment of facilitation fees at both private and public business centers. The centers include the Registrar Generals Department, Passport Office and the Driver and Vehicle Licensing Authority, DVLA, as well as some private companies. Facilitation fees are monies demanded by individuals who use it as compensation to fast track service delivery.